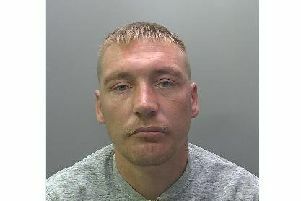 A man who burgled a house in Peterborough and stole an African grey parrot has been sentenced. Ashley McMillan, 24, appeared at Peterborough Crown Court today (11 January) after pleading guilty to burglary at an earlier hearing. The court heard how McMillan got into the house in Field Walk through an unlocked door between 10pm on Sunday, December 2 and 7am the following day and stole seven-year-old Muto and his cage. He was arrested on Thursday, 6 December, after officers identified him through CCTV, which captured him in the area with the bird shortly after the burglary. Officers who were investigating a separate burglary on Christmas Day in the Wellington Street area found Muto, who had been sold to the residents for £100, in a locked room. After speaking to his owner and identifying unique features, Muto was returned to the family later that day. McMillan, of Mewburn, Bretton, was sentenced to 26 weeks, suspended for 18 months, and 120 hours of unpaid work. The family said: “We are delighted to have Muto back; he’s a part of our family and we were devastated to lose him. DC Tom Adams said: “McMillan stole the bird in order to make some quick cash.